Death or glory, just another story? Myers, W.D. (2008). 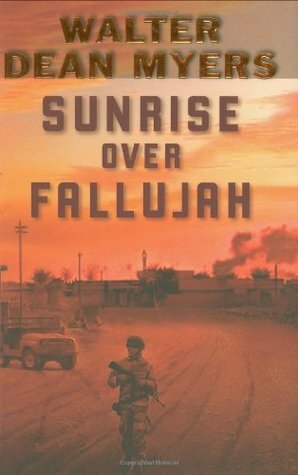 Sunrise over Fallujah. New York: Scholastic. Personal reaction to the book: This is a standard war story: Hero is wounded; buddy dies in heroic attempt to save an innocent. It wants to be an anti-war book, but spent too much time describing the details of patrols and combat to truly fill that role. It’s about the Iraq war but could have been about Vietnam, Korea, WWII, WWI, the Boer War, or the Punic Wars. Look, if you’ve never, ever read a war story before and never seen a decent war film, you might be surprised by something that happens here. About 1 percent of the novel that Catch-22 is, despite the nod to that book here. Author facts: Died on July 1, 2014, at 76. Born in West Virginia, he grew up in Harlem with his aunt and uncle. He started writing shortly after getting out of an Army stint that began right after high school.